The inception of a successful business idea begins with the creation of an equally successful business plan. Students hoping to get a head start on their entrepreneurship goals have an opportunity to do so at Tech with the annual Georgia Tech Business Plan Competition. The 13th annual competition was held last month, on February 28, at the Business School, hosting a variety of teams competing to present their ideas for cash prizes of up to $10,000. It is open to any undergraduate or graduate student, as well as recent Tech alumni. The BPC includes a series of workshops to familiarize teams with the basics of entrepreneurship and building a solid business model. These are held throughout the spring and fall. There is also a mentoring aspect, wherein each team is assigned a local mentor involved with the Atlanta entrepreneurial community to help sharpen the team’s presentation and guide them throughout the process. The scenario of the actual competition is created as an opportunity for the “company” (team) to present an idea to a group of investors, executives, nd entrepreneurs. The ideas and teams will go through two rounds before the best one is selected. There are a number of categories in the competition that are recognized, such as Best Elevator Pitch, Product Showcase, Undergraduate Venture Award and Most Innovative Technology Prize. 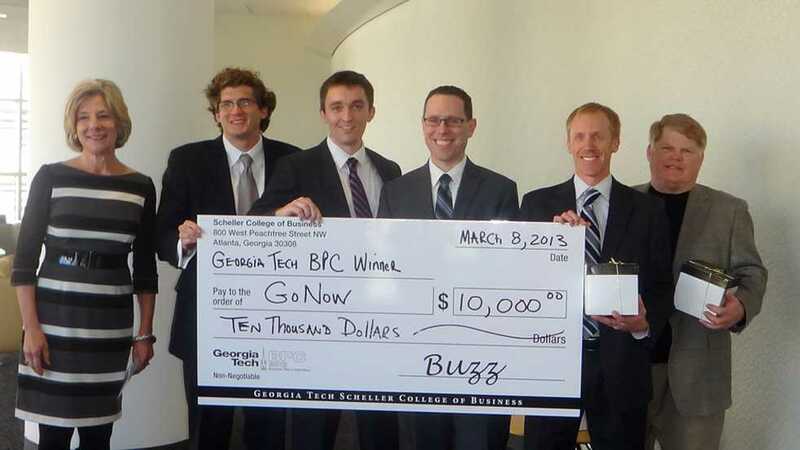 “Business plan competitions provide feedback to your plan and the judges question your assumptions from perspectives you may not have considered,” said Alex Zavorski, a member of the winning team, GoNow. “My team entered the business plan competition last year and the feedback was very hard to hear. However, we used it as motivation to prepare for this year’s competition,” Zavorski said. GoNow is a technology device that would help individuals with spinal-cord disabilities urinate easier and control their bladders with no catheters. The team is made up of Zavorski, an MBA student; Pat Converse, an MBA alumnus; Graham Sanborn, a materials science and engineering Ph.D. student and Adam Boger and Matt Parker, Emory law students. Many teams, including GoNow, compete as part of the TI:GER program, which stands for Technological Innovation: Generating Economic Results. The program combines technological development and creating product commercialization in a team structure. Graduate students participate in this program and bring their ideas to the competition where they can pitch their concepts to investors. This helps give teams a chance to bring their ideas into the market. It is an interdisciplinary program where students work in teams composed of one Tech PhD candidate, two Tech MBA students and two Emory Law students. “It was more of a class project but blossomed into something more, so we decided to compete in Tech’s BPC,” said Alice Cheng, a member of ClearView, the second-place winning team. ClearView is a mechanical stabilization device that enables frozen sectioning of breast tissue during a lumpectomy surgery. The team is currently in the process of filing for a patent and finding funding to move forward with the venture. “I am good friends now with everyone on the team and we function very well together. It’s important to have a group of hardworking, passionate individuals who are also enthusiastic about what they do,” Cheng said. Cheng is a BMED Ph.D. student and her team is mostly composed of students from Johns Hopkins University. “I think that all good ideas come from a very simple idea and a gumption to make it happen,” Cheng said.